Calculations have been performed to study the structural, electronic, elastic, mechanical, thermodynamical and phonon properties of LuS and LuTe with the generalized gradient approximation for exchange and correlation. The calculated lattice constants, bulk modulus, its pressure derivative and elastic constants are calculated. The calculated values of lattice constant are in good agreement with the experimental and theoretical results. The elastic constants have been derived from the slopes of the acouistic branches in the phonon dispersion-curves. The electronic band structure and, total and partial density of states of these compounds have been computed and analysed. The phonon dispersions curves of LuSe and LuTe for B2 phase are computed using density functional perturbation theory (DFPT) with generalized gradient (GGA) approximations. We also used the quasiharmonic approximation to calculate some thermodynamic properties such as constant-volume specific heat capacity of the B2 phase of LuS and LuTe compounds. Simultaneous Thermal Analysis (STA, TGA and DSC) unifies the simultaneous application of thermal gravimetric analysis (TGA) and differential scanning calorimetry (DSC) to one and the same wood sample in a single instrument, under perfectly identical conditions – same atmosphere, gas flow rate, pressure, heating rate, thermal contact, etc. New thermal analysis approaches for integral distinguishing between the flaming and glowing combustion of wood were discussed. The results obtained by STA were used in a new way in order to reveal the influence of plasma-aided capillary impregnation on thermal decomposition and glowing of wood controlled by oxygen and nitrogen containing flame re- tardant. New integral criterion of thermal behavior and decomposition such as specific enthalpy change has been developed by investigating samples of European White Pine (Pinus Sylvestris, Bulgaria) wood. This study has been developed also as part of a large investigation on plas- ma-chemically activated (polarized, functionalized) wood surface and its capillary impregnation with nitrogen- and phosphor flame retardant containing water solution. The investigation of the interface connection area of the three-layer tube "steel / vanadium alloy / steel" after different deformation-heat treatments was performed. Furthermore, a qualitative and quantitative analysis of the structure of the three-layer material were conducted, including analysis of the contact area of the steel and the vanadium alloy and the diffusion layer between them was obtained. 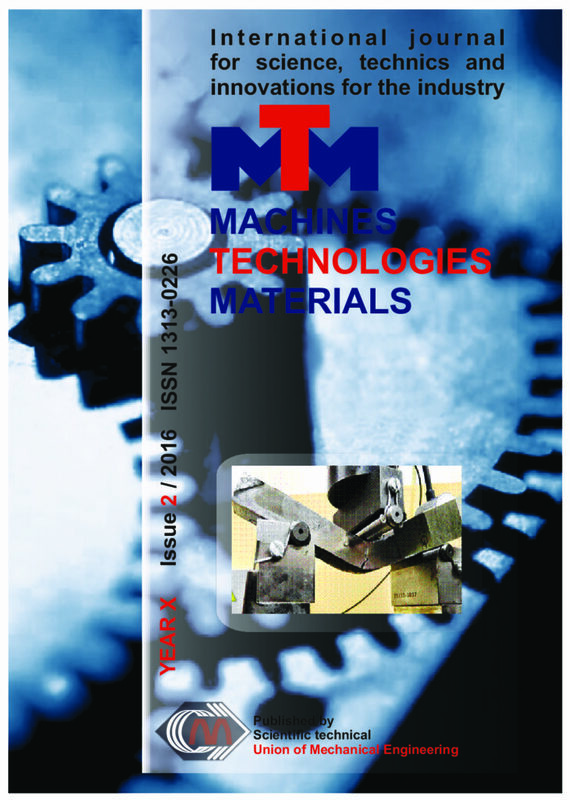 The analysis of the microstructure and mechanical properties (microhardness, ultimate tensile strength, yield strength and elongation) of three-layered material has been carried out. The results of investigations of basic physical and chemical properties for aluminosilicate melts of different compositionsis presented. It is shown that the highest values of surface tension and adhesion was observed for the basalt melts, whereas neutral aluminosilicate glass melts without iron oxides in their composition are characterized by a high value of contact angle and the lowest values of surface forces. The insertion in the melt of ZrO2 increases significantly wetting angles, surface tension and adhesion throughout the temperature range as compared with the same melts without zirconia. Basalt melts differ by lower viscosities and significantly less sensitivity to the effects of additives on viscosity of zirconium oxide as compared to the andesite-basalt melts. Properties of polycrystalline nanodiamond powder after treatment under oxidizing alkali melts of sodium nitrate and sodium hydroxide were investigated. It is established that the dried initial product contains the particles with size up to 100 microns, which are easily broken by ultrasonic treatment to size about 15 micron. A comparative grain-size analysis of samples before and after treatment of oxidative alkaline melts showed that the average grain size is reduced to 6 microns and the particles of less than 1 micron are formed. It is shown that after treatment in the oxidative alkaline melt final material does not contain non-diamond carbon and the dried powder of polycrystalline diamond practically does not aggregate. AN EXPERIMENTAL INVESTIGATION OF LIME BASED PLASTERS MOISTURE AND TEMPERATURE INDUCED DEFORMATION. The problem of the reconstruction of the historical building coat is in material comparability. The basic of the convenient material choice for reconstructions is to recognize some physical properties of used materials. The crucial properties are moisture and temperature induced expansion. The objective of this paper is to experimentally determine moisture and temperature induced deformations of two lime based plasters. The measurements are performed for moisture content from the dry state to the saturation water content and temperature range of 5 – 60°C. Temperature and moisture induced length differences were measured using LVDT MACRO SENSOR SBP 375040. In this paper analysis of power converters with parallel resonant circuit by using of computer simulations is made. The full bridge IGBT power converter is analyzing. The simulations are made in PowerSim simulation program. Calculation is the efficiency of the converter and is made harmonic analysis of the output voltage and current. Also, is made and compare on the obtained results of the parallel resonant converter with the results of the serial resonant converter in applications with variable RL-load. A work environment for modelling, simulating and performing various technological operations (milling, drilling, etc.) has been created using hardware developed to include a Fanuc M430i-A/4FH robot and specialised software Roboguide. As a result of the study, guidelines have been developed for the software and hardware improvement of the system in order to enhance its use both for the purposes of training and research. The aim of the article is to investigate the optical properties of Bulgarian honey in regard to the potential of honey discrimination on the base of its botanical origin. Samples from three types of honey (acacia, linden, and honeydew) are measured by a fluorescence spectrometer recording emission from 350 to 800 nm with excitation at 370, 395 and 405 nm. A combination of fluorescence emission spectra with some colorimetric parameters (CIELab) is used as input data of three types of honey classifiers: the first two are based on linear and quadratic discriminant analysis, and the third one uses an artificial neural network. The neural classifier is realized as a multilayered perceptron with backpropagation learning algorithm. Principal components analysis (PCA) is used for reducing the number of inputs and for a proper visualization of the experimental results. The comparative analysis of the three classifiers is based on leave-one-out-cross validation test carried out in MATLAB environment. There are many specific techniques involved in each of the four major sets of activities called POMA (Planning, Organizing, Monitoring, and Adjusting) phases. Some require extremely deep technical knowledge and others demand great social skills, in this section, we will focus on four commonly needed project management skills: project effort estimation, work breakdown structure, project status tracking with earned value and development measuring & metrics The first two of them are techniques needed in the planning and organizing phases, and the third is needed in the monitoring phase. The fourth is needed for part of planning and for monitoring. The article describes software modules of computer-aided design of vehicle power supply systems: analysis of modes of power supply systems operation, optimal choice of wire sizes, selection and verification of protective devices. The major objective of the transportation process–satisfaction and best interest of the customers using transportation services. Specifically this is manifested in the organisation of multimodal transportation based on all principles of logistic activities.